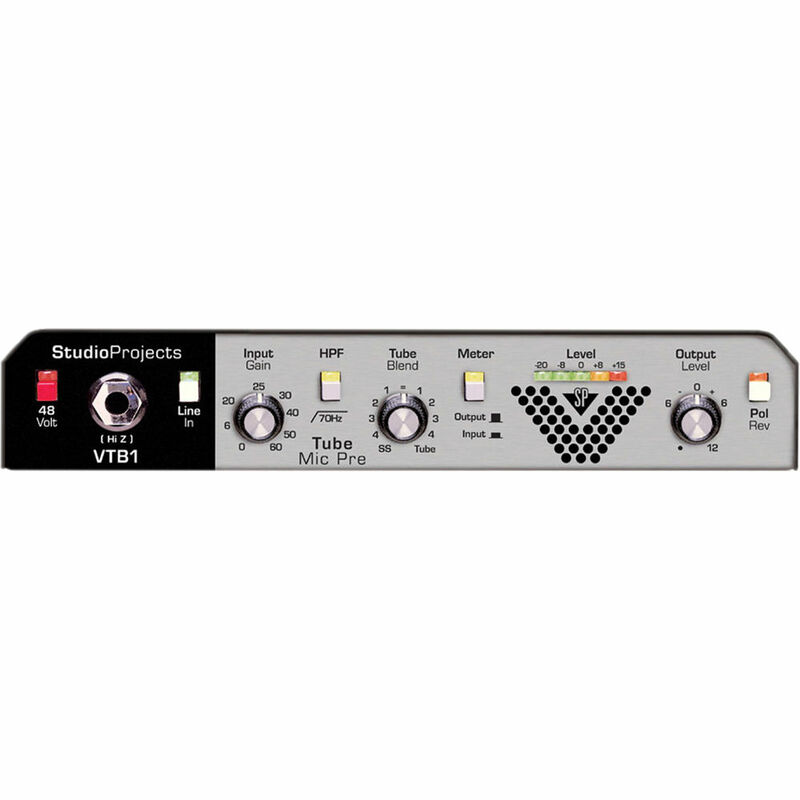 The Studio Projects VTB-1 is single-channel low cost microphone preamplifier, incorporating true class A/B switching. The unit is perfect for the professional and home project studio doing production, broadcast and voice over work. A Tube Drive control allows the user to blend as little or as much of the 12AX7 tube circuitry as required. The VTB-1 can go from a pristine solid-state sound, to any combination of Tube Drive, including hard distortion for guitars and bass. Vocal microphone preamp with warm transparent character that doubles as a Tube DI Box. Discreet, current-source fed, paralleled-transistor balanced input stage feeds a bipolar opamp balanced-unbalanced converter. A dual feedback design provides for low distortion performance while a two-stage design provides up to 45 dB gain with the second stage contributing up to 15 dB gain. FET-input opamp buffer with hi-input impedance to avoid pickup loading when used as an instrument preamp. Second stage provides adjustable gain from 10dB to 30dB with constant hi-impedance maintained. 75 Hz, 3-pole -18 dB/oct high-pass filter for low-frequency wind and rumble elimination. Constant-level blend control allows the user to smoothly change from an all solid-state path to a tube-based preamp. This allows the user to add the desired amount of tube sound to the signal without having to deal with complicated tube drive controls and such. Alternately, it allows the user to use only the solid-state portion of the preamp to get a very low distortion, un-colored sound when desired. 12AX7 vacuum tube with a DC filament supply for minimum hum and noise. First half of the tube is operated as a high-gain amplifier stage while the second half operates as a cathode follower to minimize loading of the first stage. A low-voltage plate supply is used to create a starved-tube condition for enhanced sound. Bipolar, lo-noise, high output-current opamp used for best performance. The first stage is used to provide 6 dB of additional gain and drives the line out jack and pin-2 of the balanced out. The second stage provides signal inversion and drive for pin-3 of the balanced output, effectively providing an additional 6 dB of gain. Box Dimensions (LxWxH) 14.6 x 8.35 x 3.45"
VTB1 Microphone Preamp is rated 4.8 out of 5 by 8. Rated 5 out of 5 by Anonymous from Excellent Value I purchased this preamp for use with my guitar rig. I run delay and reverb after my amp mic, and I need an inexpensive preamp to use for live gigs and practice. This preamp sounds fantastic using both an sm57, and an e609. I also had a chance to try it with an inexpensive ribbon mic and it sounded significantly better than a set of apogee preamps, thanks to impedance matching ability of the VTB1. I don't find myself using the tube blend for distortion, since I'm not a huge fan of the starved plate sound, but I do blend some tube in for added warmth. overall this is a great preamp live, or in the studio, and I would recommend it to anyone. Rated 3 out of 5 by Pete from My copy developed noise after six month use I needed a cheap single unit for portable use and simple gain on single mic to warm up some VO. The tube installed, at least for my unit, is a Sovtek 12AX12LPS, which has favorable reviews. I wasn't impressed with the blend feature, opting to stick with full SS and just use the gain, which was fine. Six months of use and it developed a noticeable noise/hum, even on full SS, and had to pull it. I replaced it with a cheaper, smaller behringer Mic100, whose result was much nicer (they hand pick each tube for the units and test), very quiet and with more useful features. Rated 5 out of 5 by Matt C. from Very happy, just fantastic! I'm an audio engineer on something of a budget. I don't generally buy cheep though, I save-up and get gear I can afford but is good enough to keep for life. This preamp is exactly that! I've onwed a VTB-1 for a few years and just bought a second one so I have a pair of good quality pres (better than my interface). These are the only preamps I will use with my ribbon mics, lots of clean gain which they need. The phantom power is stable and good, and doesn't add noise to the preamp like many others do. The tube blend feature is a bit of a gimmick but really is a lot of fun - especially nice when I record bass through the Hi-Z input. I love these preamps. They're simple and effective and have all the feaures you could want. Highly recommend this for its flexibility and general usefulness! Rated 5 out of 5 by float from great preamp, not to pricey Nice transparent sound on guitar. Tube blend is a great feature, and the reason I chose this product. I most often use it while miking a guitar amp to add some warmth before it hits my DAW. I look foward to using it on vocals and acoustic guitar. Rated 5 out of 5 by Sleepy Floyd from Great Sound Low Price Highly recommended for people on a budget. Definately improved the quality of my vocals.